My running kit is going to be getting a lot of views over the coming 6 months or so. Not only is the run being covered exclusively by the BBC in the UK, my PR team is also working hard to secure media coverage in the USA. Images of me running in this kit will appear on this blog, in my book as well as other websites and publications, I'm sure. In fact, it is my secret hope to be seen on the front page of The Journal when the run is finished. The last time I was on the front page was when I broke my ankle! If you or your company would like to have a logo applied to my kit in one of the 3 available spaces then please get in touch, in the first instance, at sponsorship@rungeordierun.com. 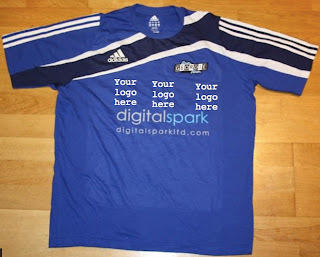 I'm after a fair rate of sponsorship for the 2 charities in return for some excellent coverage and exposure. It was round 2 in the Environmental Chamber at Northumbria University this afternoon following last week's "baseline" test. PhD students Jamie and Chris were on hand to oversee proceedings and take the usual set of stats and readings. On the agenda this week was the same 4 cycle, 40 minute session that I'd done last week on the treadmill. This time however it would be done at 37 Degrees Celsius and 70% humidity! As soon as I walked into the Environmental Chamber, the wall of heat hit me. It was like a sauna in there! I must say, though, that my first impressions were ones of great relief after having run so many miles during this very cold Winter. Remember Newcastle to Jedburgh dressed as Santa wearing 6 layers? The first 2 cycles on the treadmill felt pretty comfortable despite the hot and humid conditions. I did notice that my heart rate was far higher than last week though. The effort I was putting in didn't seem to warrant that high heart rate. The part of the test where I put the mask on was suffocating what with the temperature being so high. During the third cycle, as the speed increased, I could feel my head getting hotter and hotter. By the end of the cycle I felt quite light headed and decided to stop for 5 minutes. I actually tried to resume the test a little later but the same thing happened. There I was…..defeated and with confidence knocked. I traditionally enjoy running in high temperatures. Although today was a record high for me. I remember that there were some days in the high 20's during the John O'Groats to Lands End run back in 2007. I also enjoyed running 50 miles in Egypt 2 years ago. As remembered here. Today's test was at a higher temperature and probably, more importantly, at a higher humidity than that which I'll be experiencing in the USA. Having just re-read my Egypt report, it is evident that the long runs over there took a bit of building up to. After a long and very cold Winter of running I was straight into the deep end today. What a shock to my system! Next week is a test at an altitude of 11,300 ft. I suspect that particular test will go better than today. If all goes to plan, I'll be having another crack at this 37 degrees test the following week. I have that "beast" well and truly in my sights and will be working extra hard in training, between now and then, to get through it. I can't finish off this blog post without giving a final mention to Chris (pictured) who appeared to be sweating more than I was in the Environmental Chamber. It must have been hard work taking those readings! Thanks once again to Jamie and Chris for overseeing the session and for giving me a guided tour of the superb facilities at the Uni's Sport Central facility. The sprint track looked mightily impressive as did the climbing wall, the very grand main arena, the fitness suite and the many labs with hi-tech equipment installed. How I see the USA run in my mind's eye. I was reading through publisher, Tonto Books 2011 catalogue today and it was quite interesting to read the synopsis of my up and coming book. 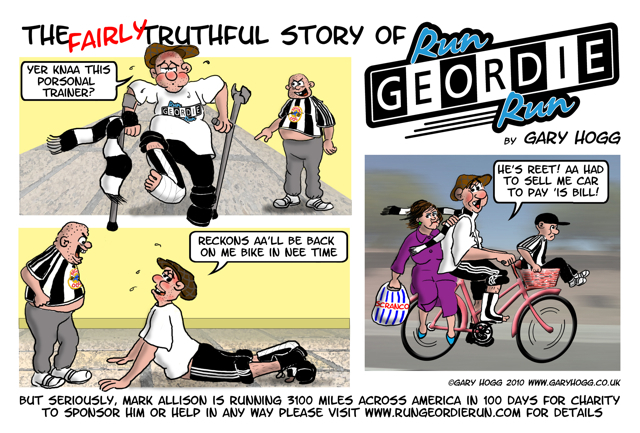 "May 2011 was the beginning of a phenomenal journey for Mark ‘Run Geordie Run’ Allison, as he geared up for the greatest challenge of his life ... a 3,100 mile run across America in a bid to raise money for two worthy causes. Run For Home: The Geordie Who Ran Across America follows Mark as he started in Los Angeles and clocked up 31 miles a day, finishing in New York city 100 days later. This book is the story behind his motivation and determination. He lost both of his parents to cancer and has worked tirelessly since to raise money for St Benedict’s, the hospice that cared for his mother during her final days. Mark takes you on the journey with him every step of the way on all the ups, downs, obstacles, adventures he encounters, characters he meets, the pain, the heartache and the elation as he, quite literally, runs for home and boldly goes where no other Geordie has gone before." This is the first time that I've seen anything in black and white regarding the run in the past tense. I say "seen" as I am constantly thinking about such details in my mind's eye. The key words in that synopsis that I truly believe are going to some the run up are "ups", "downs", "obstacles", "adventures", "pain", "heartache" and "elation". If you look carefully at the draft book cover you will see that it has a testimonial from none other than Mark Beaumont. It says "A brilliant but gruelling journey only made possible by sheer tenacity". 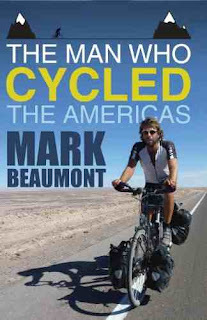 My immense admiration and respect for Mark Beaumont and his adventures is no secret. To have him provide the cover quote for the book is a very proud thing for me indeed. 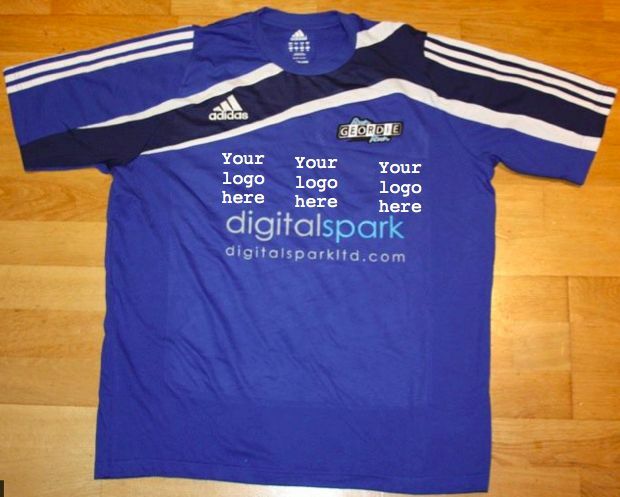 I'm very pleased to report that local accountants and registered auditors McCowie and Co have agreed to become the second kit sponsor alongside local IT company Digital Spark. 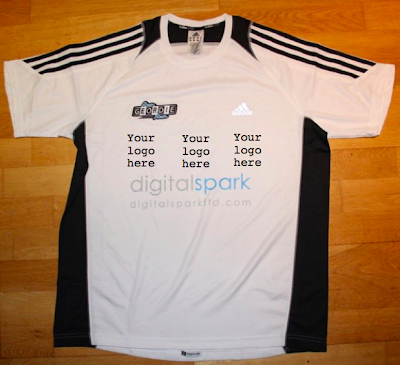 The deadline for getting all of my kit to the printers to have logos applied is this Friday the 1st of April. I have a lot of kit and there are only 29 days left before I leave these shores for the USA. 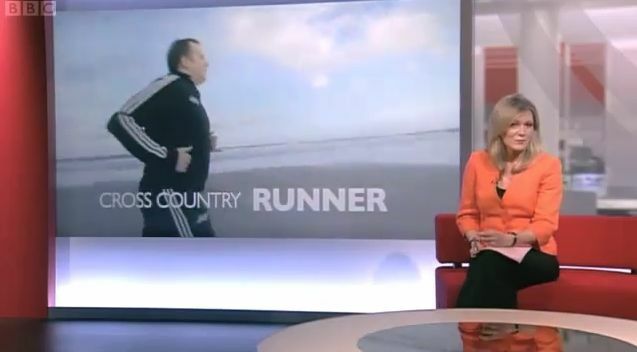 If you would like to have your company logo/name applied to the kit that will be seen on the BBC and many other places running across the USA then please get in touch at sponsorship@rungeordierun.com. It goes without saying that all proceeds from kit sponsorship go to the 2 charities; St Benedict's Hospice and The Children's Foundation. Thanks to Peter McCowie of McCowie and Co for some very much appreciated generosity and support. Coming just two weeks after the last sponsorship landmark was reached, the charity fund burst through the £26,000 barrier today. I've had a lot of pledges this last week from my colleagues in the IT department at Northern Rock also segments in the "miles in memory" scheme continue to sell well. Bishop Ian Ramsey School in Medomsley held a non uniform day recently and raised £168. This is more pounds than there are pupils at the school! Incredibly generous of them. I had originally hoped to start the run across the USA with £25,000 raised. That will now no longer be the case, which is fantastic! I never grow tired of thanking those kind folk for their donations. Please bear in mind that the small donations are just as important as the big ones. Put together, those small donations can and do make a huge difference to St Benedict's Hospice and The Children's Foundation. More specifically, it makes a huge difference to terminally ill people and children in the region. My own Mother and Father were once, sadly, some of those terminally ill people. If you would like to sponsor my 3100 mile run across the USA then please use the following links. 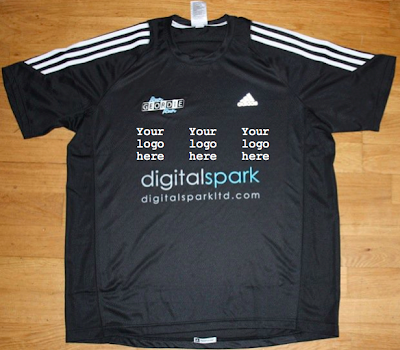 The deadline for the printers to add new logos to my running kit is fast approaching. It's the 1st of April. If you would like to have your company name/logo added in one of the spaces where you can see "your logo here" then please get in touch via sponsorship@rungeordierun.com for further details. 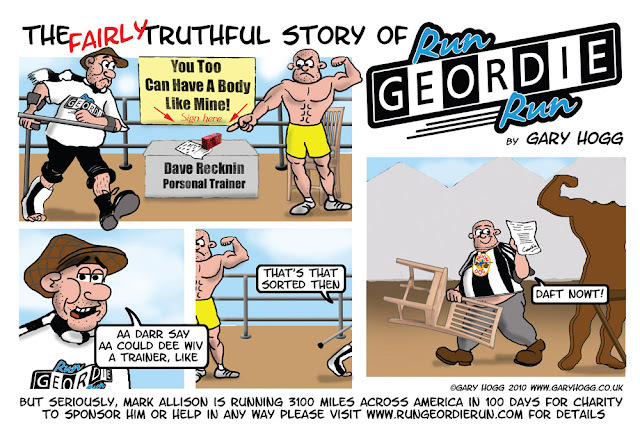 Please email your 10 second Good Luck video messages to sponsorship@rungeordierun.com. Don't forget that the journey across the USA can also be followed via my Facebook page as well as on Twitter. The final phase of training for the run across the USA started this week. It is the icing on the cake and will be carried out in the "comfort" of the Department of Sport and Exercise at Northumbria University. My first session, on Thursday, was a baseline test carried out on a treadmill in a controlled lab under the supervision of Post Graduate Researcher Jamie Tallent. It was a 40 minute session of four cycles at sea level and an ambient temperature. During the test, readings were taken for Lactate levels, heart rate, rating of perceived exertion, oxygen saturation and uptake. These stats will be compared to future weeks to see how I respond in different conditions. Next week is a test at altitude. 11'300 ft to be precise. The following week will re-create the temperature and humidity of the Mojave Desert as it will be in mid May. Thanks to Jamie Tallent and Lab Director, Dr Glyn Howatson, for letting me use the superb facilities at Northumbria University. Once again, I started a day of running with no acid present in my legs. After 3 days of running over 30 miles (including last weekend's 32) I was quite convinced at this point that CherryActive had played a more than crucial part in my recovery. Who'd have thought that 60ml of that stuff added to 900ml of water could be so beneficial. The good thing about this day was that, once the first 5 miles of climbing out of Otterburn were out of the way, the remaining 27 miles were mostly downhill. Conditions on the exposed higher ground were very cold. The icy southerly wind was kept at bay by my fives layers, a ski mask and, at times, up to 2 hats. I've said it many times during this winter; "Bring on the California sunshine". At the 13 mile point, one of my followers on Twitter, Sam Walton, stopped by to drop off some Haribo sweets. It is a random act of kindness such as this that really puts a spring in my step. I met the Support Car for the first time in Belsay and had a 20 minute stop to eat a sandwich. I also bumped into Team Run Geordie Run member, Alison Hudson, in Belsay. She is part of the team that will be running the Edinburgh half or full marathon in May in aid of the 2 charities. The next 8 miles, to Newcastle Airport, were quite comfortable and I was very pleased to eventually run on path instead of busy roads. The final 7 miles were very tough indeed. By now, the pain in my left shin was quite bad and this is something that I must address in the USA. 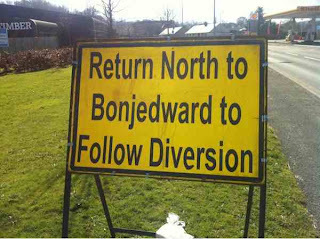 It's a problem that surfaced during my run from John O'Groats to Lands End and also during the last run from Edinburgh to Newcastle in November 2010. In the USA, I will be using a lot of ice, to keep the shin inflammation problem under control. I ran through the pain barrier for 10 days back in 2007 with this problem. If the ice treatment does not work, then I fully expect to run through the same amount of pain. I reached the Keep in Newcastle after virtually sprinting from St James' Park. It was probably nowhere near a sprint but it felt like it having just run over 100 miles in 3 days. I beat the effort from last November by 3 hours. Run Geordie Run Jr and Mrs Run Geordie Run were waiting at the finish. I was Following a quick photo, it was off home for a nice warm bath! Thanks to Mark Beaumont for sponsoring the run and also to everyone else who made a donation over the weekend. The support via Twitter and my Facebook page was unprecedented. So many messages were sent and I was able to read them all via my iPhone to keep me motivated. The Mark Beaumont Castle to Keep Challenge - finished. Thanks to a good stretch and a helping of CherryActive last night, I didn't have the slightest hint of an ache or pain going into day 2 of the Mark Beaumont Castle to Keep Challenge. This lack of pain in my legs was just plain weird! There's no way I should have felt this good after yesterday's 35.5 miles. It goes to prove that last week's good experience with CheeryActive was no fluke. I set off from Melrose at 09:00 and the aim for this leg was to better November's time of 12:32:00. I had a nightmare that day and completely lost the mental battle on the A68 between Carter Bar and Otterburn. 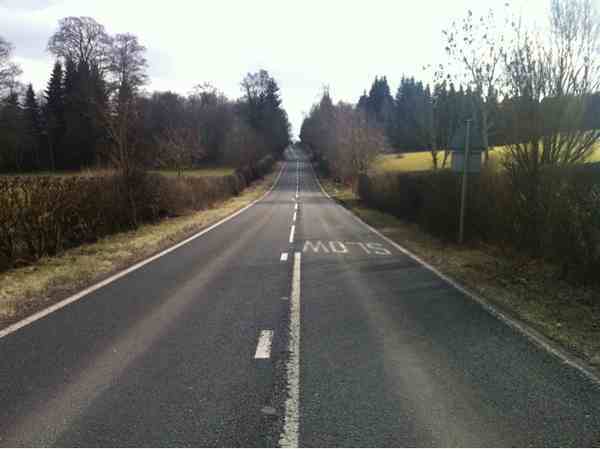 The traffic was quite busy during the first 13 miles to Jedburgh but I was given plenty of room. I was quite alarmed to see signs stating that the A68 was closed just south of Jedburgh. The final sign in yellow is pictured above. "I don't think so!" I thought. Thankfully, the friendly road workers let me through. One of them asked me where I was running to. They'd had a guess amongst themselves that it would be London. They looked disappointed when I told them that I was running to Otterburn. I quickly won them over by telling them that I would be running across the USA in 6 weeks time. The next 5 miles were just plain surreal. Due to the road closure, there wasn't a single car to be seen. I tweeted at the time that it was just like "Post apocalyptic Jedburgh". It was so eerily quiet! Mrs Run Geordie Run and Run Geordie Run jr met me at the 17 mile point with some fresh water and a cold pasta salad. It wasn't too long before I was on my way again and I left the Support Team to go and pick up my bag from the B&B in Melrose. Their job after this was to drop the bag off at the B&B in Otterburn and bring me the room key. It's a glamourous job being on the Support Team! 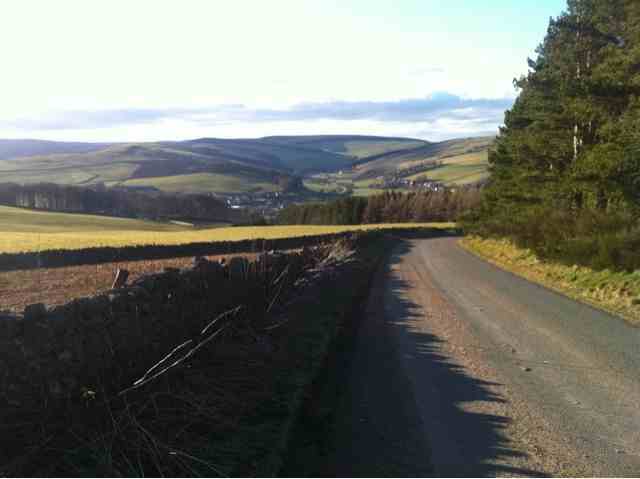 The climb up to the England/Scotland Border at Carter Bar was the usual euphoric experience. The first time I ran up that climb was in 2007 on my way from John O'Groats to Lands End. This time around, the experience didn't disappoint and, looking back, I found it difficult to take my eyes off the 2 hills that tower over Melrose. 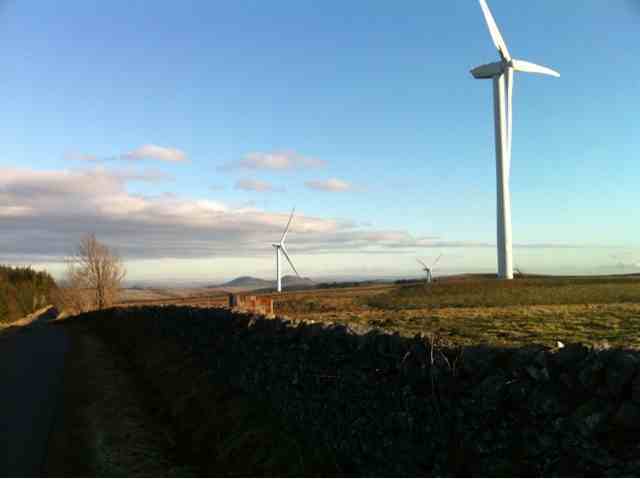 To the east and some 20 or so miles away I could see the Cheviot. Another conquest of mine on the 2009 Chevy Chase fell race. I went up and over Carter Bar and met the support team at the 26 mile point to get my room key and more fresh water. As was the case yesterday, I settled into a nice groove after the 30 mile point and started to feel stronger not weaker. Also, like yesterday, I paused for thought at the 31 mile point. This is the average distance I need to run in the USA. It's a distance that seems a lot more manageable once you run 35, 36, 37 or 39 miles like I have during this training campaign. Mile 30 to the finish line at 38.6 was done in complete darkness with only the moon for company. I'm glad to report that I had a the much stronger frame of mind that I'd been looking for compared to the last time I ran this route in November 2010. Hitting the 30 mile point knowing that there are another 9 miles to run is tough to take. You have 2 choices; give it your best shot and get on with it or simply complain about the situation. I chose the former and managed to beat November's time by a whopping 01:45:00. Today's leg was 38.6 miles and was done in 10:47:12. I'm now 02:07:00 ahead of November's time overall. It's going to take something pretty drastic to stop me from achieving a PB now. Tomorrow's route is from Otterburn to the Keep in Newcastle. It's only 32 miles! Luxury compared to the 2 days done so far. I'm aiming to leave Otterburn by 10am and finish the Mark Beaumont Castle to Keep Challenge in style. So far, this run has certainly boosted my confidence. The icing on the cake will be a PB. It was a gloriously sunny start to the day in Edinburgh and the Mark Beaumont Castle to Keep Challenge got underway at 9am on the dot. After Newcastle (of course) Edinburgh is my next favourite city. I love the architecture, the people and the many eating places of course. It's just a pity that my last two visits to this fair city have been to start a long run to Newcastle. I was only 2 miles into the run when I decided it was time to put on my warm headgear. The sun may have been shining but it was still quite chilly. The view at the 13 mile point looking back towards Edinburgh from the A7 was quite something. I was able to see the castle quite easily and it really put into perspective just how far I'd ran. There aren't many half marathon distances where you can see the start from the very end of the route. The first 14 miles flew by and thankfully I was lucky enough to run this section on a path at the roadside. Thereafter, however, it road all the way to Melrose. Miles 15 - 25 on the A7 were particularly tricky with the usual HGVs, vans and cars to look out for. I reached Stow by mid afternoon after 25.25 miles of running. There is a nice little cafe here and the soup and ham sandwich went down a treat. I refilled my hydration back pack in the toilets (needs must!) and was on my way again with the sun still shining in the sky. This was stark contrast to the last time I set off from this cafe, last November, in dark and misty conditions. The climb out of Stow was really long and steep but not too different to what I'd been climbing in the North Pennines of late. Once at the summit, it was time to take in the amazing views again. They were absolutely breathtaking and, in the distance, I could easily make out the 2 hills that tower over Melrose. I arrived at a point on the road that had caused Support Man Carlton and I some confusion last time we did this run. It was a road with a dead end sign. The confusion being that Google Maps on my iPhone clearly shows a road without any obvious obstruction or end. It was decision time! Would I take the normal road that Carlton and I had back in November or would I risk this slightly shorter way with the possibility of having to turn back? I started off down the road with the dead end sign and almost straight away, with the other road in view, I could see that it was going to save about half a mile. That is, if I didn't have to turn back at some point. 2 miles down the road I was greeted with a locked fence that stretched from one side of the road to the other. "Brilliant", I thought, "this is obviously the so called dead end". I easily managed to run around the fence and make my way on to Melrose. With a weak mobile phone signal not helping matters, my support driver, Mrs Run Geordie Run, was unable to find me. I asked her to wait for me in Melrose and I'd meet her there with my change of kit for tomorrow. Fortunately, I had some water left and more importantly, a huge bar of Cadbury's Whole nut! Miles 30 - 35.5 were arguably the best of the whole run. Not the fastest though! I managed to keep a nice rhythm and, thanks probably to the bar of Whole Nut, energy levels were very good indeed. I reached the hotel at 19:30 and the time taken today was a whole 27 minutes quicker than the last time I ran this route. The dream of a PB is, therefore, still very much alive. I'm fully aware of just how difficult day 2 of this run is. 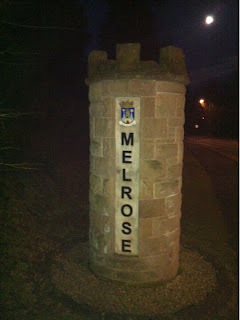 Melrose to Carter Bar along the A68 is about 23 miles. I hope to reach there by 17:00 at the latest. The remaining 16 miles will be so tough. I lost the mental battle the last time I ran that route. Somehow, I'm going to be looking for a much stronger frame of mind this time around. I expect to finish at about 22:00 tomorrow night. I had originally thought that the clocks go froward this weekend. This would have meant 1 less hour of recovery between days 2 and 3. Fortunately for me, BST starts next weekend! Brilliant! 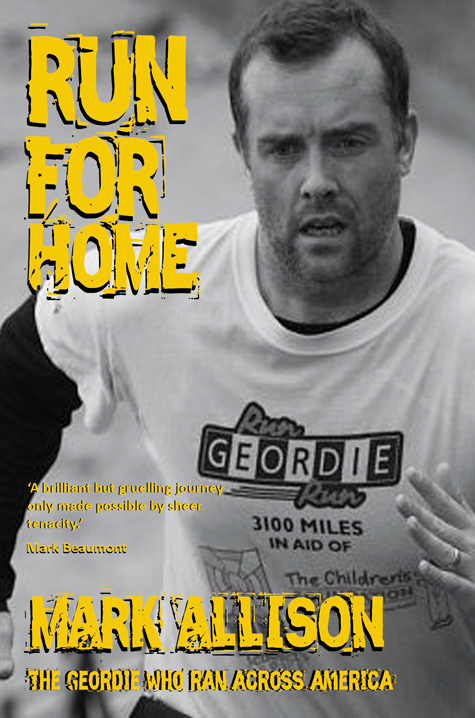 Thanks to everyone who sent me a message via Twitter or the Run Geordie Run Facebook page. This kind of support really helps. Please keep the messages coming. Thanks also to those kind folk who made a donation today also. The fund is progressing nicely towards the £26,000 mark. And so to sleep now and to dream of a tough yet victorious day 2 on the Mark Beaumont Castle to Keep Challenge. The Mark Beaumont Castle to Keep Challenge started at 08:56 this morning. It was a lovely sunny start to the day but still a little on the chilly side. I'm largely unsupported today so I'm running with a backpack full of water and energy bars. Melrose is the target today. I'm currently 5.5 miles into the 36 mile route. Bids for the naming rights of this weekend's Castle to Keep Challenge have been made throughout today and started at just £2. As I was on the way to Edinburgh tonight, a winning bid of £250 was made. It came from none other than one of my absolute all time heroes; Mark Beaumont. Mark cycled from John O'Groats to Lands End when he was just 12 years old! In 2007, he set a world record for cycling all of the way around the world. A distance of 18,296 miles covered in just 194 days and 17 hours. There was a BBC documentary and a best selling book that covered the round the world trip. It was Mark's cycle ride (with 2 climbs) from Anchorage in Alaska to Ushuaia in Southern Argentina, via the highest peaks in North and South America in 2009/10 that really got me captivated. I followed Mark's highly engaging journey via Twitter and various updates on Radio 1 for 9 months. The 3 part documentary to accompany the trip that was broadcast soon after on the BBC was absolutely fascinating and extremely inspiring. The corresponding book for this trip is due for publication in May this year. I'll be arranging it's delivery on the run across the USA via one of my support team. Thanks to Mark for a very generous donation to the 2 charities. Now for the small matter of running 107 miles from Edinburgh to Newcastle over the next 3 days. This particular run will be called the "Mark Beaumont Castle to Keep Challenge". It's the final big run before I set off for the USA next month. I'll be looking to set a PB for this route, more to keep me on my toes and pushing on than any other reason. Mark said "I am very happy to support such a great effort. Good luck over the next few days and I look forwards to following your progress.". Fellow Scotsman, former British Lion and now Scotland's Attack Coach, Gregor Townsend tweeted "Good luck tomorrow - only 98 miles further than my longest run on the same route! Kudos to sponsor @MrMarkBeaumont". At the time of writing, my Twitter feed was full of messages from kind folk wishing me good luck for the next 3 days. I've always maintained that this kind of support will be invaluable during the run across the USA. Tomorrow morning will see me start running, unsupported, from Edinburgh Castle between 8 and 9. 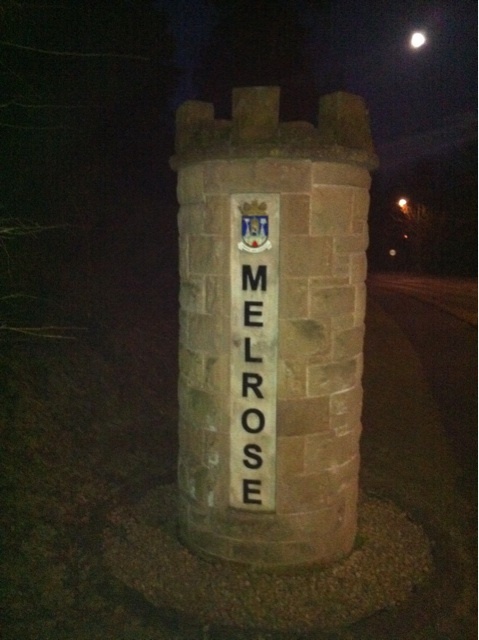 It's 36 miles to Melrose and I hope to get there just after sun down. Hopefully, there'll be a hearty bowl of soup to be had in that little cafe in Stow on the way. Here's to a successful 107 mile "Mark Beaumont Castle to Keep Challenge". Watch this space for updates during the day or via my Twitter page. The final "big run" before I run across the USA starts this Friday. It's a tough little route from Edinburgh Castle to the Keep in Newcastle. It will take 3 days and 107 miles to complete this mostly unsupported run. 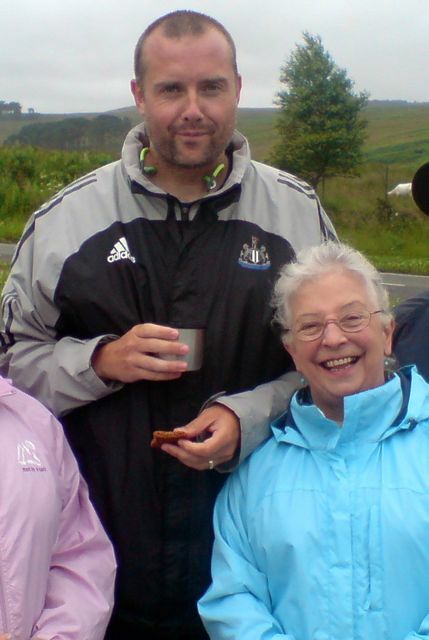 There will be a few cameo appearances from Mrs Run Geordie Run and a flask of hot soup from the Run Geordie Run mobile. For the most part, though, I will be carrying my spare kit, water and energy bars in my trusty backpack. Just like the last time I ran this route back in November 2010, I'm expecting thousands of hits on this website and lots of interest on Twitter. With that in mind, I'm currently looking for a sponsor of this run with all proceeds to be split between The Children's Foundation (Charity No 1000013) and St Benedict's Hospice (Charity No. 1019410). The run will be known as "The INSERT YOUR NAME HERE Castle to Keep Challenge". The event and your name/company name will get mentioned on this website, on my Twitter page (currently 4,300 followers), on Facebook (currently 1550 followers and over 500 friends). 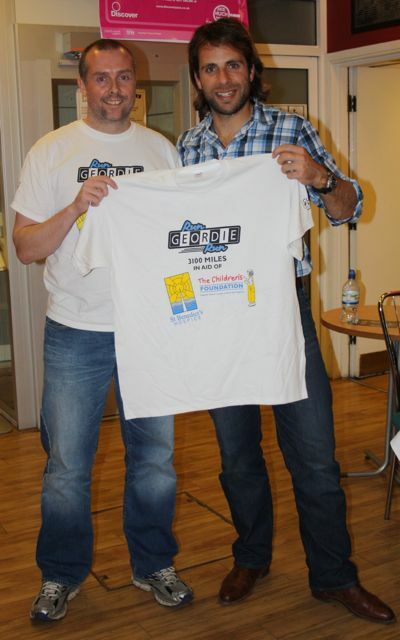 If you'd like to sponsor the run then please drop me a line with your bid amount at sponsorship@rungeordierun.com. Bidding will close at 10pm on Thursday and will be done via email and via my Twitter page. I'll post regular updates on this blog with regard to how the bidding is going. Please get bidding folks and help make this weekend's journey, the final big training run, a success. This is the route that I will be taking. Click on it to be taken to Google Maps. I've had a few requests from schools in the region recently asking how they can help to raise funds for the charities supported by Run Geordie Run. It's very nice to think that young people in the region are inspired by the run across the USA and are willing to do what they can to help. 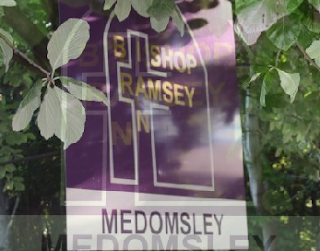 The very first school to put words into action is Bishop Ian Ramsey School in Medomsley, County Durham. The very kind teachers and children at the school have kindly pledged their support to Run Geordie Run and the 2 charities. Headmaster, Mr Boyle, was taken aback when he found out about my little run across the USA and had little hesitation in asking the children to help raise funds for St Benedict's Hospice and The Children's Foundation. I heard today that the first event they have planned is a non uniform day on the 18th March. The children will pay £1 for the privilege of dressing in their "home clothes". Brilliant! That will be followed up with a Cookie and Bun sale on the 1st April. Finally, an easter egg raffle will be held, bringing the school's fundraising effort to a close just before I set off across the USA. Thanks, in advance, go to the children, teachers and parents for their fundraising efforts. They are very much appreciated by me and, of course, the 2 charities. If your school would like to follow the example set by Bishop Ian Ramsey school and help raise funds for Run Geordie Run's 2 chosen charities, then please get in touch at sponsorship@rungeordierun.com. Have you got a video camera, iPhone or smartphone with camera? Would you like to send me a 10 second good luck message for publication on this site and to help motivate me and keep my spirits up during the run across the USA? 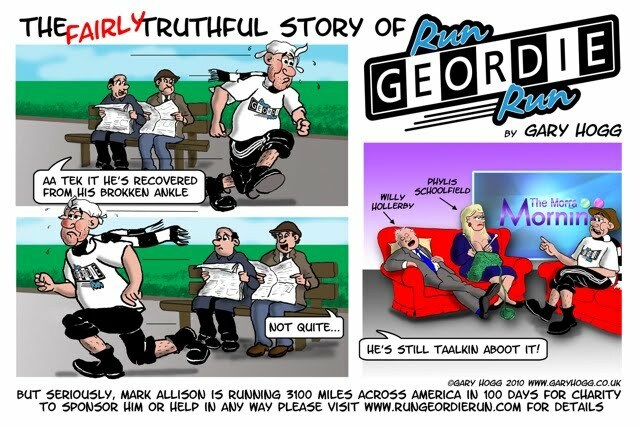 If the answer to both questions is "Yes" then please email your videos to sponsorship@rungeordierun.com. CherryActive - A fantastic discovery! I have been trying a different recovery drink this weekend following a tough hilly 32 mile run from Alston to Shotley Bridge (via Nenthead, Allenheads, Blanchland, Edmunbyers and Snods Edge). The drink in question, CherryActive, was recommended to me by the Department of Sport and Exercise at Northumbria University. They have been doing some research recently regarding the benefits that the product offers. I was sent the product in concentrate form along with a CherryActive sports bottle, dispensing pump and extensive literature explaining the details of how the product benefits recovery and more. I've ran over quite a few hills recently and I'm well accustomed to the muscle soreness the day after. As you can see from the elevation profile of yesterday's run to the left there were plenty of hills taken in. If there was ever to be a day where my legs were going to be sore, today was it. I've got to say though, that after drinking a 120ml serving of CherryActive with water soon after yesterday's tough run that today's muscle soreness was nowhere near where I expected it to be. And nowhere near where it has been lately after a run of this distance and type. 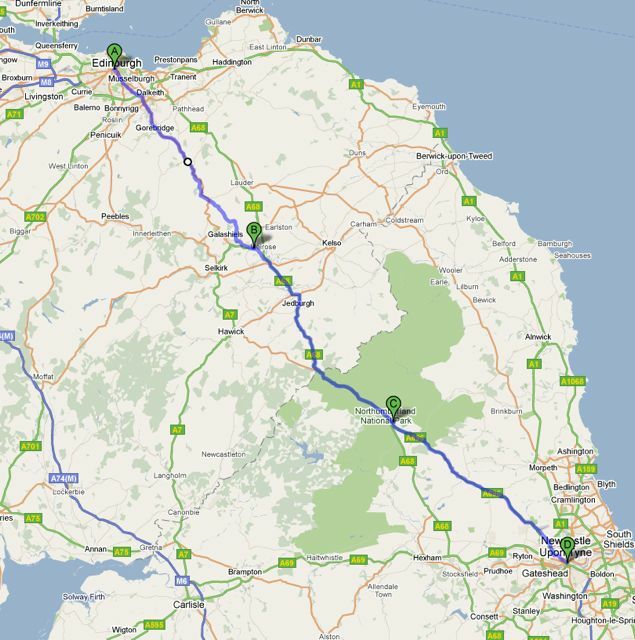 I'm going to reserve total judgement until I've ran 107 miles from Edinburgh to Newcastle this coming Friday to Sunday. Even if I reap 75% of the same benefits that I have today, then that run is going to be a lot easier. That is, if running 36, 39 and 32 miles in consecutive days can be deemed easy at all. Now the science bit: "CherryActive products are made from 100% Montmorency cherries, carefully grown and processed to harness their powerful antioxidants and flavonoids. Scientific research has demonstrated how consumption of these compounds can help support: healthy joints and muscles; restorative sleep patterns; normal uric acid levels and boost your body's natural defences against free radical damage. CherryActive also have many athletes and sports professionals as customers, as the products support rapid muscle recovery and help them maintain strength after strenuous exercise." As for the flavour of the product, I prefer it with the maximum recommended concentrate. i.e. 60ml per 946ml bottle. The taste is right up my street and very far removed from any other recovery drink I've tried. i.e. not as sickly and sweet. This is a major consideration for a product for me as I'm going to be using it for 100 days very soon. 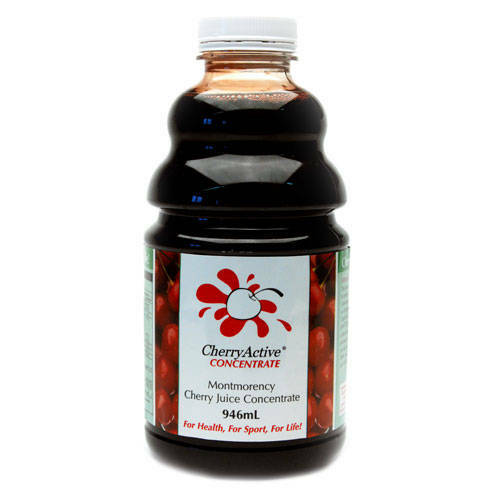 The CherryActive website says "It can be mixed with water to make a delicious cherry juice, or added to other fruit juices, smoothies, natural yoghurts or sports recovery drinks". This is one to be explored as the possibilities for creating tasty CherryActive based recovery drink concoctions are endless! Finally, thanks to my friends at CherryActive for supplying a sample of the product and for offering to give me further supplies for use during the run across the USA. Thanks also to Northumbria University for pointing me in the direction of this gem of a product. For further info or to order the product please visit www.cherryactive.co.uk. Regular readers will remember that I was live on the Real Radio Breakfast show with Gary and Lisa 2 weeks ago. I was given a load of airtime in which to promote the run and to issue Gary with a little challenge; to run the final day of the run across the USA with me. That final stretch will see us run about 24 miles from the George Washington Bridge to the north west of Manhattan to the finish line in Coney Island. I should be 5 stone lighter by then so Gary is going to have his work cut out in what promises to be a tough final day. If you would like to listen to the challenge as it was broadcast, then you can listen to the "best bits" of the show for that week here. Ohhhhhhh, we're half way there…. Last week, the charity fund for St Benedict's Hospice and The Children's Foundation burst through the £24,000 barrier. I thought it would be at least another month before the next milestone would be reached. Oh how wrong I was! On Friday night I attended my Aunty Joyce's 75th birthday party. Aunty Joyce (pictured left during my run from John O'Groat's to Lands End in 2007) is not my real Aunty but I've known her since I was a toddler and she has always been there for me ever since. Such is Aunty Joyce's nature, instead of asking for presents, she called for the party guests to make a contribution to 3 charities. The first was a Cerebal Palsy charity and the other 2 were the ones I'm raising funds for; St Benedict's Hospice and The Children's Foundation. It was a great night and a chance, not only to celebrate, but to catch up with some very special people. Aunty Joyce rang me the following day with the news of how much money was raised. I was 5 miles into a 32 mile run from Alston to Shotley Bridge at the time. On the highest point on the C2C route at 1961ft to be precise. I was absolutely staggered to hear that £1000 had been raised on the night through donations and a raffle with some top prizes! In that raffle was the very last Run Geordie Run t-shirt and some Run Geordie Run CDs. The winners asked me to sign the items, which I did with a very red face! £500 of that £1000 is winging it's way to the 2 charities that I raise funds for and the rest to the Cerebal Palsy charity. The £500 will be donated to the 2 charities under my "miles in memory" scheme. 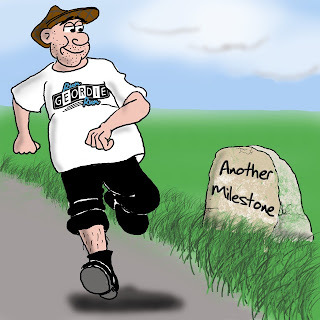 Those particular miles will be dedicated to Aunty Joyce's late husband and my Uncle John. As a result of Aunty Joyce's party, the charity fund now stands at an amazing £25,305.34. Just over 50% of the fundraising target has now been reached. Of that amount, only £2563 is "traditional sponsorship" i.e. to be paid upon successful completion of the run. The rest has already been given to the 2 charities. £76,689.34 has now been raised since I started running for charity in 1994. It goes without saying that I'll be working extremely hard, as I always have, to warrant this kind of support. Meanwhile, thanks to Aunty Joyce and her family and friends for helping to get the charity fund over £25,000. Please email your 10 second Good Luck messages to sponsorship@rungeordierun.com. Just a quick update to say the halfway point of my fundraising target has been reached. The fund now stands at £25,305. I'll put the full story on my blog tomorrow, once I've recovered from today's 32 mile effort from Alston to Shotley Bridge. 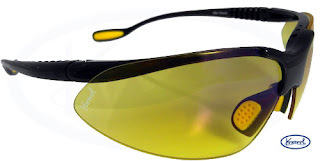 Product Review - Kontrol Sports "Gelshock Yellow Lens Sunglasses"
A few months ago I was asked by Kontrol Sports if I would like to try their sunglasses while running. I’m always keen to try out new kit so I jumped at the chance. The only downside, or so I thought at the time, was the fact that it was the middle of Winter. What possible benefit could I get from wearing sunglasses at this time of year? 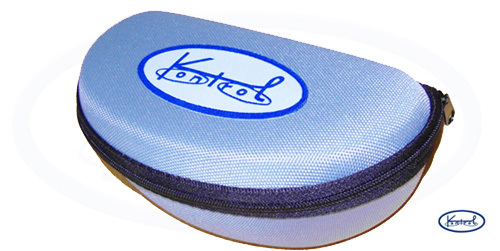 The sunglasses arrived in a sturdy protective case with a cleaning cloth. There are many models to choose from and the ones I tried out were the “Gelshock Yellow” model. 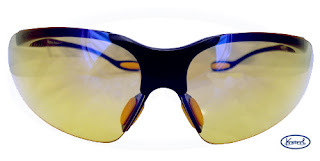 This particular model is designed for overcast, hazy or foggy conditions. Just as well really, as the morning I chose to try them out on was particularly overcast. I set off on the 10 mile off road route with the sunglasses on. First impressions were good. The sunglasses were very light and extremely comfortable. It was at this point that I realised that wearing sunglasses on an overcast day in the middle of winter wasn’t such a bad idea after all. In laypersons terms, I can only describe the lenses as having the capability of brining the dimly lit scenery, in which I was running, very much to life. The Kontrol Sports website describes what the sunglasses do as “Improves contrast, reduces glare, and preserves sharpness..”. I can’t disagree with that and I will certainly be using this particualr model where similar conditions dictate the need. In summary, the Kontrol Sports Gelshock Yellow Sunglasses ticked all the boxes for me providing excellent visibility and comfort. They are also reasonably priced too. Oh, I almost forgot, as a final test and out of curiousity, I tried the sunglasses while driving at night. All I can say is that if the sunglasses performed well when I was running, they were outstanding at night while driving. Once again, bringing my line of sight to life with excellent sharpness and clarity. For more information on Kontrol Sports Performance Eyewear or to view their range of sunglasses then please visit www.kontrolsports.co.uk. This photo is of all of the pairs of shoes I've gone through in training so far. Thanks to Brooks for supplying them. 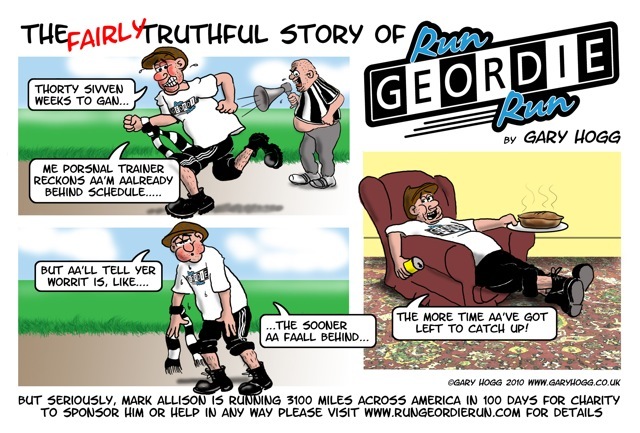 Look out for the new "Fairly truthful adventures of Run Geordie Run" cartoon in this month's The Mag as drawn by Gary Hogg. You can catch up on previous episodes from The Mag and The Journal here. I'm pleased to report, with great relief, that all drivers posts on the Support Team have now been filled. Phew! I also have a month of sports therapy cover between weeks 3 and 7. Ideally that cover should be more but I'm grateful for what I have got. 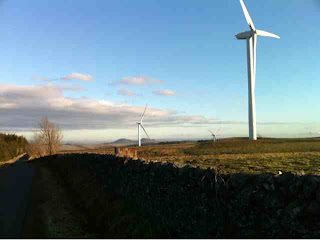 Prior to the run starting, I'll update this blog with details of the folk in the Support Team. In the meantime, the team to see me safely across the USA is Richard Scholfield, Jon Cockerill, Stephen Cook, Kirsty Reid, Steve Harrision, Andy Witherspoon and Carlton Fletcher. 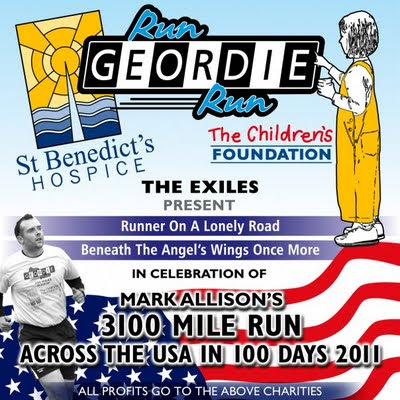 The 2 charity songs written and recorded especially for Run Geordie Run by The Exiles are continuing to sell well in iTunes. I took delivery of the final songs back in 2009. The first track I listened to was "Runner on a Lonely Road". Within the first 10 seconds of listening to it I couldn't believe just how catchy it was. Brilliant! This was a song that delivered a message of never ever giving up and getting to the finish line against all the odds! Intertwined in all of that was also a message that the run would be done in memory and dedication of those people who were dearly important to the runner. This is evident in the lines of the song that start "I'll go another mile for.....". You can buy the 2 songs from iTunes by clicking here. As per usual, all profits go to the 2 charities. 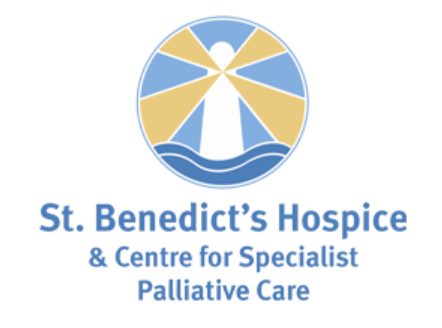 Thanks to a donation from the Northern Rock Foundation today, the fund for St Benedict's Hospice and The Children's Foundation burst through the £23,000 barrier today and currently stands at £23,419.34. For the benefit of my Stateside readers, that's 38,096 US dollars. I'm now aiming to have £25,000 raised before I set off running across the USA. Given, people's generosity and kindness towards this run I fell that it's a very achievable target. Of course, the overall target is £50,000. It goes without saying that I'll be going all out to hit that target by the time I get to New York. If you would like to sponsor me for the run then these are the links. Any amount, no matter how small or large will be vastly appreciated. I was live on the Real Radio Breakfast show with Gary Phillipson and and Lisa Shaw this morning. I was given a very pleasing amount of airtime between 07:30 and 08:00 and managed to talk a lot about the run across the USA and the 2 charities. And as an added bonus I got to mention some of my commercial sponsors including Brooks and Peter's Pies. To top things off, I "threw down the gauntlet" to Gary live on air asking if he'd like to join me for 20 or so miles on the final day in New York. I'm pleased to say that he duly accepted the challenge and it'll be great to have Boro supporting Gaz guide me to the finish line in Coney Island. It wasn't too long before one listener had nicknamed him 'Gary Gump'. I'll be giving Gary and Lisa an update of my progress every Monday morning while I'm in the USA. That's something I'm looking very much forward to doing every week. OK, so there is the small matter of the time difference but it's worth it. 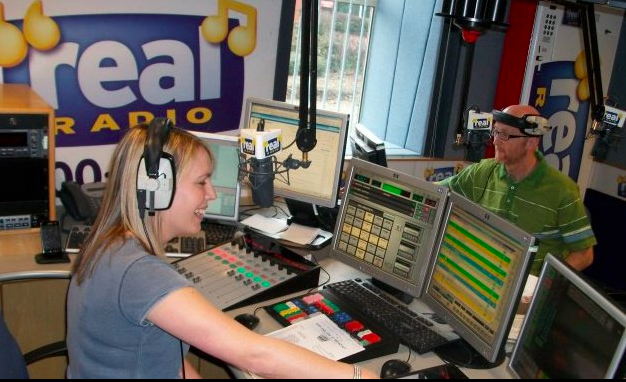 I left the Real Radio Studio absolutely buzzing this morning. I love doing live interviews on the radio. I would have stuttered my way through this a couple of years ago but I now seem to be very much media ready and well equipped to take on any questions thrown my way. I was thrilled to hear Bruce Springsteen's "Born To Run" being played when I was driving away. This is one song that I'll be keeping in my locker for those tough times in the USA. 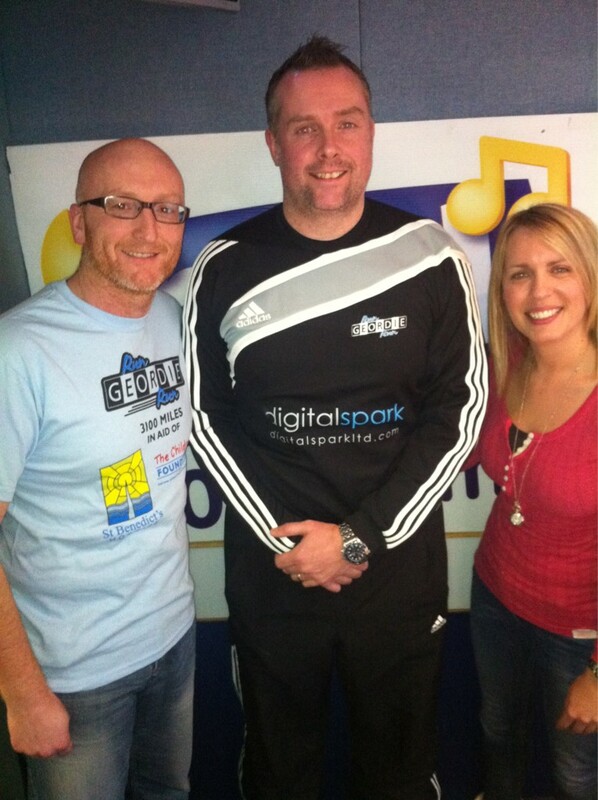 Thanks go to Gary, Lisa, producer Mac and Stephanie Finnon for looking after me so well this morning.